Its approaching 4 years since Brian and I packed up and moved to Virginia. We came from North Carolina, but had only lived there for one year so were really still Floridians at heart. Having spent the first 22 years of our lives in the Sunshine State we were new to the whole idea of seasons, or at least noticeable seasonal changes. Each year I discover new subtleties in the transitions from one season to the next. I'm getting good at knowing which flowers in my yard will be first to wake from their winter slumber (snowbells) and which trees will show the first signs of life (plums). I've even finally realized that just because the temperature reaches 70* one weekend in early March, it doesn't mean that we won't have snow two days later. I know this, yet I'm still surprised each year. Even with all I've learned in the last four years, I’m still trying to get used to the radical temperature swings that Virginia sees when transitioning from Autumn to Winter and Winter to Spring. Last weekend the highs were forecast to be in the mid-60's, perfect weather for getting seeds planted in the garden, yet when I woke up Sunday morning my bedside thermometer read 28*. Since I knew what was to come later that day, I quickly called my walking buddy Christine (due any day now with her baby girl!!!) and rescheduled our stroll for the afternoon, when the weather would be more pleasant. And then I crawled back in bed. Though it postponed my morning exercise, what this cold morning did afford me was longer snuggle time under the covers with Brian and our dogs, a large pot of coffee after finally making my way to the kitchen and the opportunity to make this recipe that I found at Seven Spoons some weeks earlier. We all know that I love oatmeal (who doesn't? really?) so I was excited not only to discover Tara's lovely blog on Tastespotting, but to be introduced to it through a recipe that was so very perfect for me. 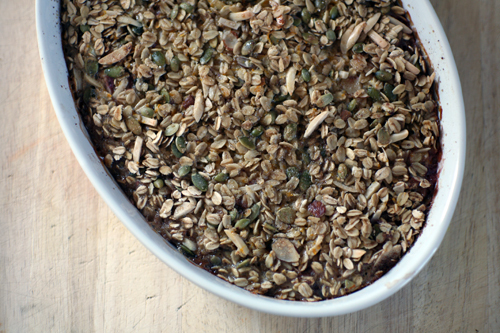 Oats, fresh fruit, almonds and pepitos and some of my favorite spices all baked together into a warm, satisfying breakfast...what's not to love? This dish was really delicious. I substituted fresh strawberries for Tara’s frozen blueberries and added some orange zest because, well, I think everything is better with a bit of citrus. There are endless possibilities of fruit and spice combinations, and I think you could even substitute some or all of the sugar for honey or maple syrup. It would make for a great meal when you have a couple of house guests but it also heats up exceptionally well the next day if you want to keep it all for yourself. Preheat oven to 375°F (190°C). Lightly grease the inside of a baking dish, 2-quart capacity. 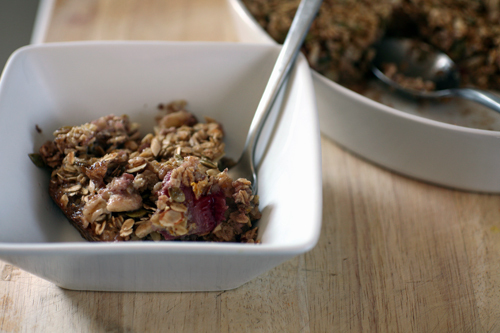 In a medium bowl, mix together the oats, almonds, brown sugar, pepitas, flax seeds, baking powder, orange zest, spices and salt. Set aside. In another bowl, whisk together the milk, egg, almost all of the butter (save about 1 teaspoon for drizzling over the finished dish), vanilla and maple syrup. Set aside. 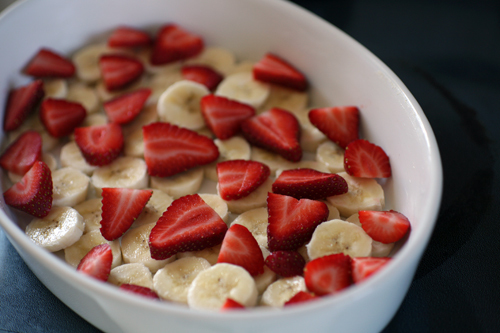 In the prepared baking dish, spread the diced bananas in an even layer, then scatter the strawberries over top. 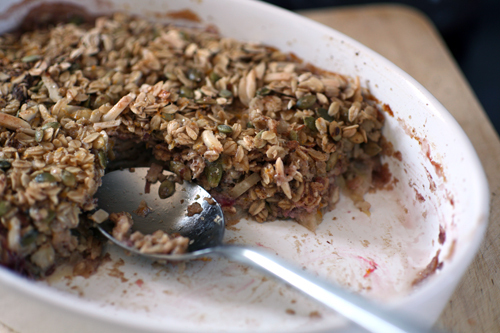 Pile the oat mixture to cover the fruit, but do not pack too tightly. Carefully pour the wet milk mixture over the oats. Drizzle over the reserved butter, sprinkle with coarse sugar, and bake for 35-40 minutes, until the oatmeal is puffed and set, with a golden brown top. Meghann is hosting another Blogger Bake Sale to raise money for The Leukemia and Lymphoma Society! Not only do I love Meghann because she is my cousin, but this girl is so incredibly inspirational. I love reading about her accomplishments with running, fitness and healthy eating. 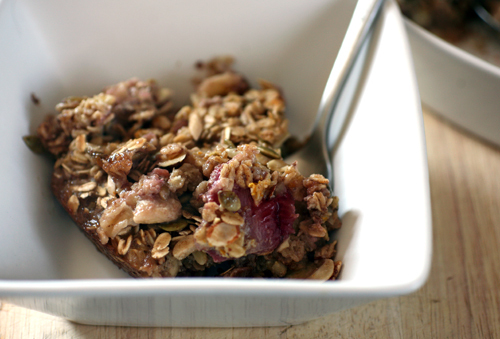 She's competed in many races and come up with some really great recipes. Read about her first bake sale here - she raised $1320 for a great cause!!! I'll be donating this and this, so be sure to check her blog on April 6th to place your bids!! !